Last year was, well, a “dream” at Walt Disney World in Orlando with a host of attractions and the Disney Dreams Giveaway with randomly awarded prizes to visitors. But guess what? As if sprinkled with pixie dust, this year is even more magical! For starters, Disney has extended the Year of a Million Dreams all during 2008. A million or more prizes will be awarded including new fairytale experiences that money can’t buy. 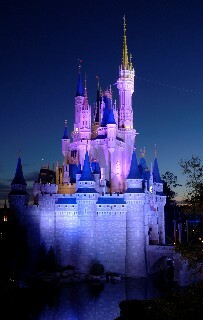 For example, a lucky winner might spend New Year’s Eve in the Cinderella Suite inside the Magic Kingdom’s Castle (sigh). Another winner might enjoy a private day at Castaway Cay, Disney’s island in the Bahamas, Castaway Cay. Yes, you and your family might have the whole island all to yourself as the fortunate couple (shown above*) did recently. (ah, bliss!). Other prizes – ones you’re more likely to win -- include everything from “pixie dust” Disney pins, Dream Mouse Ears that light up and Dream Fastpass Badges. Those badges are good at all Fastpass attractions. They’ll allow you to avoid waits in long lines. A star-studded trip to the High School Musical 3 film premiere;. The opportunity to serve as Grand Marshal in parades in Disney parks in Florida and worldwide. A Peek Behind The Curtain at Walt Disney Imagineering. Other prizes that money could actually buy – but which would take a bundle to acquire – include “Disney Takes You Around The World” vacations. These are designed for the winner and up to three guests each year through Sept. 30, 2012. They include a Bahamian cruise aboard Disney Cruise Line; a trip to Australia, China or another worldwide destination with Adventures By Disney, and trips to Disneyland Resort and Walt Disney World Resort. 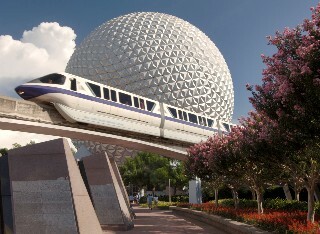 Cruisers also will discover a host of new attractions throughout Walt Disney World that all travelers may enjoy. Here’s a sampling of the new features. 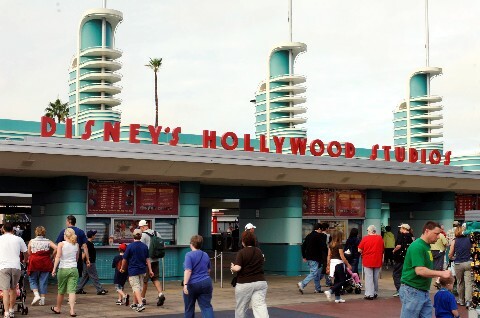 The former Disney-MGM was renamed Disney’s Hollywood Studios in January. The idea is to better reflect the park’s embodiment not only of the Golden Age of Hollywood but also all that Tinseltown has to offer in modern times. Arguably the most exciting new attraction at Disney’s Hollywood Studios is Toy Story Mania! 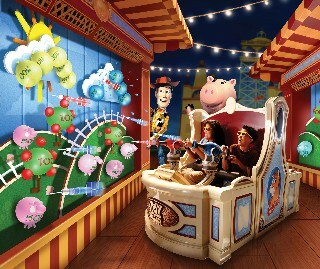 Opening this summer, this technological, cutting-edge theme park attraction combines favorite characters from Disney-Pixar classics "Toy Story" and "Toy Story 2" with games that match their motion picture personas. Guests don 3-D glasses, hop on fanciful ride vehicles and seemingly shrink to the size of a toy as they follow a midway-themed route. The challenges are designed to be fun for everyone from beginners to serious gamers. Another new offering is Playhouse Disney—Live on Stage! It presents a whole new cast of friends from Playhouse Disney this year. The show is ideal for families with young children and the young at heart. Kids will be clapping, singing and dancing along with their friends from Mickey Mouse Clubhouse, Little Einsteins and Handy Manny. Block Party Bash is a new interactive parade that invites visitors to play, party and dance in the streets of Disney’s Hollywood Studios beginning this spring. This new parade replaces the Disney Stars and Motors Cars motorcade. Highlights of the Block Party Bash include high-flying acrobatics, rocking-to-retro tunes and more than 20 Disney-Pixar characters from The Incredibles, Toy Story 2, Monsters, Inc. and A Bug's Life. Disney’s Hollywood Studios also brings the global High School Musical phenomenon to life with a new interactive street party, High School Musical 2: School’s Out! A high-energy cast invites audience members to join in the fun. The party showcases five new songs from High School Musical 2 and one from the original show. High School Musical 2: School's Out! replaces High School Musical Pep Rally. It performs daily in front of the park’s iconic Mickey’s Sorcerer’s Hat. In late 2008, also at Disney’s Hollywood Studios, will be a new “American Idol” attraction inspired in the television/pop culture phenomenon. Participants will experience the audition process in front of a Disney producer. And after working with a vocal coach, hair stylist and make-up artist, the guest will perform in front of an audience and a panel of judges. Guest performers with the highest votes will compete in an end-of-day Grand Finale show. The winner of the Grand Finale show will receive a guaranteed reservation for a future regional stadium audition of American Idol (without waiting in long lines). Foodies have plenty to rejoice about with lots of new dining developments at EPCOT for 2008. Tutto Italia Ristorante (Everything Italy) is a new restaurant in the Italy pavilion. It’s presented by the California-based Patina Group of Chef Joachim Splichal. An expansion and grand opening is planned for late 2008. 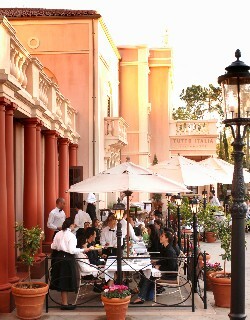 The restaurant showcases cuisine from different regions of Italy. It features an open kitchen and a menu with freshly made breads and pastries, handmade mozzarella and pasta and a variety of wines. Meals begin with such complimentary starters as vegetables, bruschetta, crostini and olives. Special features include the “Abbondanza Family Table” with family-style platters for sharing at lunch and dinner, an outdoor dining area (shown above*) and a gelati cart. 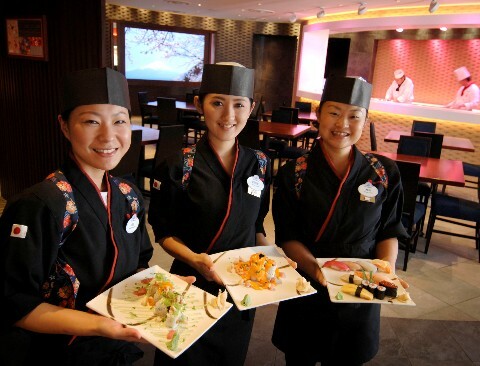 Recently unveiled at the Japan pavilion is the new 140-seat Tokyo Dining. 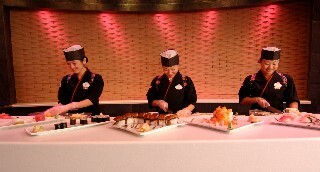 This dining room has a “show stage” as its focal point; here diners may watch the sushi chefs in action (see photo at left). Nearly 50 varieties of sushi and sashimi and six varieties of sake are served along with tempura, grilled steaks and seafood. In addition, the redesigned Teppanyaki Dining Rooms have been renamed Teppan Edo. With sleek and stylish interiors, Teppan Edo features such delights as Kobe beef. The China pavilion’s Nine Dragons restaurant is undergoing a transformation. When it reopens in fall 2008, Nine Dragons will boast an innovative dining room featuring five cooking stations where guests may interact with chefs from China. In the Mexican pavilion, a 50- to 60-seat tequila bar featuring a history of the popular beverage will open this summer. That pavilion’s waterfront Cantina de San Angel also is expanding with more seating – for more opportunities to enjoy those fabulous World Showcase views — and will offer a new menu. Landry’s Restaurants recently introduced a new pan-Asian eatery, the Anandapur Yak & Yeti, to the Asia section of Disney’s Animal Kingdom. You might enjoy an appetizer of mussels in white wine, lemon grass and Thai basil broth. Entrees include seared Miso salmon and tamarind chicken. The yummy desserts include fried wontons (skewers of fresh pineapple and cream cheese wontons with vanilla ice cream and honey vanilla drizzle) and delectable mango pie with fresh whipped cream and a raspberry sauce. 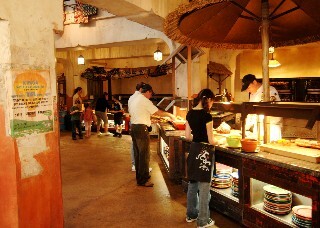 In addition, Tusker House Restaurant in Disney's Animal Kingdom has reopened as a buffet restaurant. It now includes a character breakfast called "Donald's Safari Breakfast." Hours are 8 a.m. to 10:30 a.m. and 11:30 a.m. until the park closes. The Disney folks have not released any information yet, but during a recent visit I noticed a new structure rising next to Disney’s Contemporary Resort, a stone’s throw from the Magic Kingdom (where the former North Wing of the Contemporary Resort and Disney’s Racquet Club formerly stood). Staff at the Contemporary speculated it might be additional rooms for the hotel. Sources not affiliated with Disney report that the crescent-shaped waterfront structure will be a 16-story tower for the newest Disney Vacation Club property with a completion date of 2009. A Disney spokesman would not confirm or deny, stating that he did not have any information to share at this time. Officially confirmed, however, is that a new table-service restaurant, The Wave, will open this spring at the Contemporary Resort’s Main Tower. The restaurant will offer American cuisine with international flavors. The 220-acre Jostens Center is the latest expansion project for Disney’s Wide World of Sports Complex. The new multi-sport facility for amateur and professional sports will include 45,000 square feet of competition space. It will accommodate six basketball courts, 12 volleyball courts or two roller hockey rinks, as well as locker rooms and meeting rooms. Set to open in summer 2008, it will allow Disney to double the number of indoor sports events it can accommodate. In Downtown Disney, Landry's Restaurants will soon be treating families to a prehistoric experience including a face-to-snout dinosaur encounter and hands-on educational activities at the T-Rex Café. The new facility combines table-service dining and retail in an interactive prehistoric environment built around water, fire and ice. Many cruise lines operating from Port Canaveral offer pre- and post-packages that include stays in the Orlando area. If you’re interested in staying at a Walt Disney World property, you have a choice of 23 owned and operated resorts. They range from value resorts like Disney’s Pop Century (shown at right with rates from $82 per night), to moderate properties like Disney’s Port Orleans French Quarter/Riverside (from $149), and from deluxe resorts like Disney’s Animal Kingdom Lodge (from $225) to home-away-from-home villas like Disney’s Old Key West and Saratoga Springs (from $285). · Extended Park Hours – Disney resort guests enjoy extra time in the theme parks with the free Extra Magic Hours benefit. Each day one of the theme parks opens an hour early or stays open up to three hours after its regular closing time, exclusively for enjoyment by Disney Resort guests. Disney Water Parks offer Extra Magic Hours every morning. · Disney’s Magical Express – This complimentary service offers roundtrip airport transportation and baggage delivery service to guests of select Disney resorts. You bypass baggage claim at the airport and the bags magically appear in your room. At the end of your vacation, you enjoy free transportation back to the airport. The airline check-in counter at your Disney resort allows you to get your boarding pass and check your luggage from your hotel, bypassing airport check-in completely. · Disney Dining Plan – You can enjoy up to 30 percent savings per person on dining when you purchase the Magic Your Way Package Plus Dining, available to guests of select Disney World hotels. You can choose from more than 100 select restaurants with the peace of mind of knowing that most meals are pre-paid. In addition to your Magic Your Way Base Ticket and Disney Resort accommodations, the Magic Your Way Package Plus Dining includes, per person per night’s stay, one table service meal, one quick service meal and one snack. · Additional Benefits – Been shopping? You don’t have to lug your packages and souvenirs around all day. Disney resort guests enjoy Package Delivery –You can have your purchases from select Disney shops delivered to your hotel. 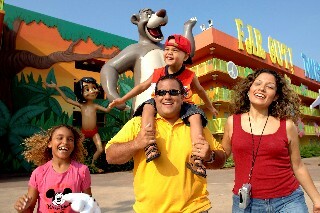 For information on all central Florida theme parks at Walt Disney World call 407-W-Disney or visit www.disneyparks.com.